Mini Vanilla Apple Strudels Recipe - Follow the bellow steps to know how to cook Mini Vanilla Apple Strudels for more than ten peoples. 1. Preheat the oven to 400˚F/200˚C. 2. Spray a muffin pan with oil. 3. Peel apples. Set apple peel aside for decoration, if desired. 4. Dice apples and put them in a large bowl. 5. Add lemon juice, sugar, and almonds, and mix. 6. Roll out half of the puff pastry until thin, and cut into three even, long slices. 7. Coat the slices with cream. 8. Spread half the apple mixture on all three slices, covering three quarters and leaving about an inch empty at the sides. 9. Brush all the edges except the bottom one with water. 10. Roll the dough over the apple mixture from bottom to top, until you have even rolls. 11. Pinch the sides of the rolls to seal them with dough. 12. Cut rolls in the middle and transfer with the closed side down into the greased muffin pan. 13. Repeat with second half of puff pastry and apple mixture until you have 12 strudels. 14. Mix vanilla powder and with half of the milk described in package (usually 1 ½ cups). 15. Pour 2-3 tablespoons into each strudel. 16. Spread egg wash over strudels. 17. Bake for 25-30 minutes, until golden brown. 18. Take strudels out of the pan and dust with powdered sugar. The leftover apple peel can be rolled into “roses” for decoration. 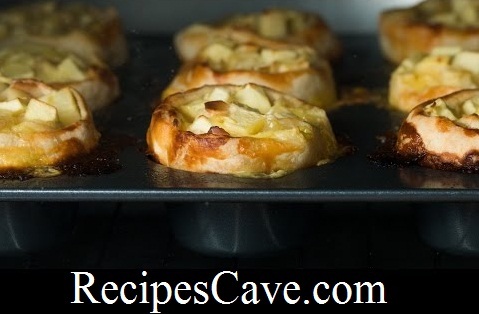 Share Mini Vanilla Apple Strudels Recipe with your friends.